At the turn of the 20th century, Carleton Washburne would have appeared an unlikely hero. Born in Chicago, Illinois in 1889, Carleton led an unremarkable life. His school career was reasonably average for the son of well educated professionals, but he did not excel. Plodding through life and looking for a path to follow, Carleton turned to his father’s love and attempted to follow in his footsteps by studying medicine at the University of Chicago. Things did not go well. His grades fell and his interest waned. Now frustrated with his life at University of Chicago and left with very few options, Carleton gravitated instead to his mother’s interests. Carleton’s mother was a strong willed, politically active woman, untypical of the age. She was a friend to the famed progressive educator John Dewey and would regularly engage with him over many issues. The parlour would buzz with passionate debate about the purpose of education and how it might be bettered as the young Carleton listened eagerly while he played. From the very beginning, Carleton’s life was one steeped in education theory and policy. Carleton attended a Dewey school, Francis W. Parker School, in Chicago as a young child and would later go on to become a founding member of the John Dewey Society and president of the Progressive Education Association. Carleton dropped out of UoC and headed to a new university that was starting to establish itself in California: Stanford. No longer pursuing medicine, he chose to study education. As with all young men in the final year of a degree course, Carleton would have needed focus and dedication to his course to be truly successful. However, in that same year, Carleton fell deeply in love with Heliuz Chandler and all thoughts of studying took second place. Their first child was on the way. Despite this, Carleton did manage to scrape through and graduate. A mediocre university degree in hand and with no real direction in life, Carleton turned his focus to becoming an entrepreneur. Enthused by what he believed to be a sure fire business success, Carleton borrowed money from any source he could and invested it all in his new idea. It failed. Badly. Now unable to support his family and with no other options in life, Carleton was faced with only one route out of penuary: he reluctantly became a teacher. Carleton’s first post was as a teacher of science in an underachieving school in the poverty stricken city of La Punete, California. The experience changed Carleton forever. Unlike the comfortable, educated and supportive family life that Carleton had experienced and thought the norm, he was now faced with disengaged children from families failed by the education system. He began to see that the model of schooling prevalent in the United States acted as a harsh filter: the entire population was pushed into the system at the beginning, but year by year, the system ‘filtered out’ huge swathes of children, which it destined never to become educated. The system and society at large truly believed that some children were capable of learning whilst others, of low ‘aptitude’, were not. This had a profound impact on Carleton. He began experimenting with his approaches, drawing on the experiences of his own Dewey education and the regular espousing of a progressive education he absorbed as a child, Carleton questioned whether it would be possible to create an education system that resulted in every single child being successful, rather than just the small 5% who appeared to be the result of the filter that he saw as the US education system. He became obsessed with conceiving and implementing an approach that could achieve what he saw as the best practices of teaching an individual in a one-to-one tuition scenario but applied at scale to a group of students. Aristotle was a pupil of Plato, but following Plato’s death in 348 BC, he moved from his beliefs in Platonism to becoming dedicated to empiricism. He immersed himself in empirical studies and sensory experience became central to his view of epistemology. When, in 343 BC, King Philip of Macedon asked Aristotle to become the tutor of his son, he carried this view of epistemology into the methods he deployed as a tutor, knowing that he required multiple approaches for teaching any particular idea so that the young boy in pupilage would always, in time, be able to learn the fact or skill at hand. The son was to become, of course, Alexander the Great. As his tutor, Aristotle was afforded great wealth and opportunities to establish vast amounts of educational resources. He established a library at the Lyceum and brought about the publication of many hundreds of books, including tomes on the nature of knowledge and approaches to tutoring and pupilage. The methodologies of Aristotle and Plato formed the basis for the approach to be widely adopted in delivering a classical education. A one-to-one tutoring, where the tutor and pupil are intricately linked such that the tutor is always aware of what the pupil’s level of knowledge is and how to build upon the knowledge or to correct wrong thinking before moving on. This approach to individualised instruction remained the dominant model for teaching for centuries to come. Carleton was well aware of the success of the Aristotle approach. He recognised that individualised tuition was the best method of teaching a child. It was clear that the ability to notice a pupil’s misunderstanding immediately, such that the tutor could take action in the moment, was key. But how could this be achieved when a single teacher is faced with not one individual following a pupilage, but a large group of children, all with different backgrounds, in a classroom setting? Carleton began to trial approaches in the classroom aimed at integrating aspects of individual instruction, such as immediate feedback and intervention. He was determined to educate that ‘whole child’. Adaptive Learning has become an important phrase in education in recent years. Around the world, venture capitalists and large education publishing companies are investing billions of dollars into trying to build distance learning web applications that can guide students through a course without the need of a teacher. The technology is in its infancy, despite the rather outrageous claims from some EdTech companies to the contrary. Nonetheless, the need for large scale individualised instruction grows ever more as the world’s population increases and the demand for education seem insatiable. 60 million children in the world today do not go to school and will never meet a teacher. Frederic Lister Burk was born in 1862. Following a career as a journalist in the San Francisco Bay area, Frederic paid for himself to attend graduate school at Stanford University by taking on temporary teaching jobs in a variety of private and public schools throughout San Francisco, before embarking on a full time career in education. Throughout the 1890s, Frederic refined an innovative model for self-instructed learning, in which the student received only very minimal input from a teacher. A staunch progressive and follower of Dewey, Frederic believed the school system that had emerged in the US and much of the Western world was failing students and needed to be overturned. He devised new pedagogies for working with students that aimed to adjust to their personal needs and progress – instructional materials were created to allow students to move forward without the assistance of a teacher. Along with Mary Ward, Frederic conceived and produced sets of self-paced, self-instructional learning materials aligned with extensive and intelligent self-assessment materials, which allowed their learners to progress at a rate that was completely individual. Frederic Burk had invented distance learning a century before it would capture the imagination of return-hungry investors. The model proved such a success that it piqued the interest of educators across the State. Frederic and Mary tried to spread the impact of the approach by publishing their findings and the materials that supported the programme, but were stopped from doing so by the California Courts with a ruling that only the State Board of Education could publish printed instructional materials. An entire and complete curriculum, proven to be successful, with all the materials already authored and available, which would have saved countless teachers countless hours of work and research, was prevented from spreading and becoming embedded at scale because bureaucrats at the State Board of Education could not stomach the fact that Burk and Ward had produced instructional materials without their input. This smallminded act would hold back the growth of an important model for schooling in a way that those public servants had not even considered. Frederic would later go on to become President of San Francisco State University, but it was in 1914, when Frederic was President of the San Francisco State Teachers College, that he spotted the work of a new teacher in a run down school in La Punete. Carleton Washburne admired Frederic and was keen to accept the job offer that he made. Carleton left La Punete and headed to the San Francisco State Teachers College to work alongside Frederic Burk in an associated elementary school linked to the college. He spent five years at the school as Head of Science, whilst also studying for a PhD in education at University of California, Berkeley, making Carleton one of the first ever recipients of a doctorate of education. When wooly mammoths migrated across what is now modern day Illinois in the last Ice Age, the hunters who occupied that area 12,000 years ago used the Green Bay Trail to track and kill their prey, feasting on the plodding giants. The Potawatomi tribe continued to use the Green Bay Trail for thousands of years before the arrival of Europeans, when early settlers moved West towards Chicago. In 1832, the trail became an official post road by an Act of Congress. In 1836, Erastus Patterson and his family arrived from Vermont and opened a tavern to service passengers on the Green Bay Trail post road between Chicago and Green Bay. The first houses were erected and the birth of the new village of Winnetka had begun. Winnetka, incidentally, means simply “beautiful place” in Potawatomi. The village grew into the affluent town of 13,000 inhabitants that it is today. Winnetka is the second wealthiest town in the United States and at its heart stands the Carleton W Washburne Middle School. In 1919, Frederic Burk became aware of an opening for superintendent of Winnetka School District 36. He recommended Carleton for the role and so began Carleton’s leadership of Winnetka’s schools, which lasted until he finally resigned in 1943 to help the war effort by opening schools for displaced children in occupied Italy. Carleton now had the opportunity he needed to implement his ideas at scale. As superintendent, he was able to develop a new model for schooling and roll it out across the schools in the district. He called it The Winnetka Plan. Inspired by John Dewey’s work at University of Chicago Laboratory School and those formative experiences in the troubled La Punete school, Carleton set about developing a model for schooling that would bring success to all children. He drew on Aristotle and the work that Mary Ward and Frederic Burk had done on individualised courses, creating his new blue print for education. The Winnetka Plan set out a system of individualised instruction in an ungraded setting, which aimed to develop the ‘whole child’. Carleton split the curriculum into two strands: the “common essentials" (reading, writing, number skills, history, and geography) and "creative group activities" (such as art, music, literature, and physical education). The grade work divided into specific tasks to be learned by each child individually. Subject material was arranged in a journey through the learning, with distinct steps to be taken. Only when students showed 100% success on tests could they move on to the next step in learning the subject. Carleton recognised that in an Aristotle model, the student would always be progressing at a pace unique to themselves and that Ward and Burk had already created the means to make this possible. The “common essentials” tests could be taken at any time and the student could continue their journey towards, what Carleton termed, mastery. Carleton was convinced that every single child could be successful in the “common essentials” in this “mastery model for schooling” because he could use Frederic’s instructional and assessment materials to ensure that all students at all times could progress with minimal input from the teacher. Rather than putting "gifted" students into higher level classes, the students struggling with schoolwork were given special ‘corrective’ support to immediately address those individual problems. Most of the time, the struggling student received one-on-one help from a teacher. Carleton had finally created a means for freeing up the time that a classroom teacher needed to work in the tutor-pupil manner, so favoured by Aristotle and millennia of educators. It was clear to Carleton that, rather than accelerating a small group of so-called gifted children, the purpose of schooling should be to ensure that every child is extended and successful. Henry Clinton Morrison was a contemporary of Carleton’s, working at the University of Chicago Laboratory School, who was particularly influenced by the Winnetka Plan. Morrison further developed the idea of immediate intervention, formulating "a variety of correctives” which included “re-teaching, tutoring, restructuring the original learning activities, and redirecting student study habits". Morrison continued to test and iterate on the complete curriculum materials developed by Frederic and Carleton. He worked with numerous schools for many years, refining the model and producing more and more materials, which could easily be adopted by schools at scale. By the early 1930s, the model was becoming mature. It is important to note that this “mastery model for schooling” only applied to the common essentials, which Carleton believed were the bedrock of leading an autonomous and fulfilling adult life. The creative activities had no achievement standards: each student did as much or as little of these as they chose and no tests were ever given. Carleton implemented the Winnetka Plan from 1921 across all schools in the district. He observed, measured, tweaked and improved the model year after year, with the help of Morrison and others. Attainment in Winnetka schools rose and rose and rose. Soon, Winnetka and Carleton began to draw national attention. Not only was attainment rising, but pupil engagement and satisfaction also soared. For the first time, ‘aptitude’ was not defined as whether or not a child had the capacity to learn, but instead viewed simply as how long that child would take to learn. Every child would, always. Increasingly, schools imitated the approach that Carleton had developed and mastery became a dominant model for schooling across much of the United States throughout the 1920s and 1930s. Benjamin S Bloom passed away in 1999 at the age of 86 in Chicago, Illinois. I met him only once, but his enthusiasm and wisdom were immediately infectious. In his lifetime, his work became one of the single biggest influences on educational models and policy. In 1981, a survey of educators found that Bloom was already a significant influence on curriculum structures and approaches to delivery. Unfortunately, this influence largely stems from Benjamin S Bloom’s work Taxonomy of Educational Objectives: The Classification of Educational Goals, outlining a classification of learning objectives which he began writing in 1956, with many volumes to follow throughout his life. Known as Bloom’s Taxonomy, this weighty tome was repeatedly reduced to a single pyramid diagram. The tiers of the pyramid strike a chord with most people – they feel good – and so, as is so often the case in education, schools and teachers en masse implemented their own versions of the Taxonomy from simply reading the titles on the diagram without once reading the book. The trouble is, Bloom’s Taxonomy, wonderful though it feels, is somewhat bunkum! Many in education belittle Bloom because of ‘that bloody pyramid’, which sadly means that a large number of educators have gone no further with his work. But Taxonomy of Educational Objectives is not Bloom’s magnum opus. His greatest work lies elsewhere. In the late 1950s and into the 1960s, Bloom became increasingly interested in the seminal work that Carleton had carried out some decades earlier and was keen to build on the success shown in those schools throughout the 1930s. It was in 1963, when Bloom read an article by the Harvard University professor, John B Carroll, that led Benjamin to formulate a clearer view of Carleton’s mastery model. Carroll’s article, “A Model for School Learning” debunked the widely held belief that some children are good learners and some are poor learners. He argued instead that student aptitude more accurately reflects an index of learning rate. In other words, that all children can learn well but differ in the time that they may take to do so. Of course, this was not a new way of thinking: Aristotle would have recognised it and it was a principle commonly held by Comenius, Herbart and Pestalozzi. Bloom was encouraged by a model in which, if a child was allowed the right amount of time, and spent that time ‘appropriately’, then the child would always attain the required standard. At around the same time, the American psychologist and behaviourist Burrhus Frederic Skinner had further developed Carleton’s work and coined the phrase ‘programmed instruction’. Other behaviourists took the work even further, creating a program similar to Carlton’s mastery model, with a focus on the role of feedback and individualised learning, allowing students to move at their own pace and receive instant feedback on their current performance. It was Fred S Keller, in the mid-1960s, who took the behaviourists’ ideas and theories and applied them practically. The Keller Plan (often referred to as Personalised System of Instruction or PSI), is reminiscent of the work that Frederic Burk and Mary Ward had carried out years before in that Keller and his team actually produced the instructional materials required to implement the approach with real students. Keller created written texts, which were broken into units of content that were arranged so that the student engaged with prerequisite content, new learning, then elaboration of sufficient complexity as to be effectively infinite in its scope. The units would be studied at the student’s own pace, much like the units that Burk and Ward had authored. Each unit required students to demonstrate that they were ready to proceed to the next. A proctor would certify whether or not the student had achieved the required level of understanding before moving on. These proctors were often teachers or other expert adults, but Keller also suggested that older, more expert students could act as proctors for their younger peers. The nature of some of the key influential works that led Carleton and Benjamin to their formal setting out of the model, often leads to the misconception that a mastery approach is one in which the teacher plays a minimal role. Researchers have often read the individualised and self-paced nature of the work of Frederic Burk and Fred Keller, with often no teacher input, to imply that Carleton and Bloom’s models must follow suit. This could not be further from the truth. Both Carleton and Bloom fundamentally recognised that, in order to make a mastery model successful, the teacher – like an Aristotle tutor – is the key. The scene was set: Bloom was poised to formalise and codify mastery. What followed in the coming decades was not only Bloom’s true magnum opus, but also one of the most important lifetime’s work of any educator to date. Benjamin S Bloom pulled together the essential features of the mastery model and spent much of his life refining the instructional and assessment materials, the pedagogies and didactics, and the methods of deploying the model at scale in a practical way (for example, through non-graded schools). He continually tested its efficacy and integrated advances in technology for achieving greater impact. Just as Carleton was driven to develop the model by an emotional experience – teaching deprived children in La Punete – so too was Bloom determined that his work in education should achieve good. Knowing that, while students may vary in their learning rate, all students could learn well given the right amount of time, Benjamin was heartbroken that what he saw around him was an education system that consigned the majority of the population to a life of subordination. He knew that if teachers could allow the right amount of time for each student to learn and could provide all students with the appropriate conditions to learn, then every student could learn well. Benjamin was a pragmatist. He knew that there was little point in an educational model that could not be embedded at scale and, in the US system of the day, that meant a system where students were taught in group based classrooms. Looking around, he saw that schools would break curriculum journeys into small units, which would be delivered at the students and then tested. The results of these tests would be used to grade and rank students. The next unit would then be served up. Giving a speech for Cambridge University some years back at the British Library, I described my sadness at the fact that England, as with most North-Western cultures, had firmly embedded what I coined as a ‘conveyer belt model for schooling’. The conveyer belt starts when children enter schooling. Identifying the age of the children, the conveyer belt serves up content determined correct for that class – these children are aged 8, so they get aged 8 content – regardless of where those individual children actually are in their development in learning the subject. This conveyer belt is rigidly expressed in national curricula and often strengthened by school inspection systems. When a unit of content is complete and the students are labelled with a grade, the conveyer belt simply keeps on rolling. It takes no account at all as to whether the student was successful in learning the unit or not and, because the conveyer belt cannot be stopped for teacher fear of ‘falling behind the curriculum’. The student never has the chance again to demonstrate what they have learned. Benjamin noted the same sadness decades before as he observed that the end of unit assessment marked the end of the time that students were required to keep working on a concept or idea. The assessment, used only to rank and label, brought nothing at all to the learning of the student. Just as Carleton had rejected the ‘filter’, Benjamin recognised (and proved) that this approach resulted in only a small number of students learning well. He represented the population of students as having attainment very close to a normal distribution curve. It was clear that both one-to-one tutor and classroom teacher could, if they chose, use assessments as real opportunities to enhance the learning process rather than to simply label students. Washburne, Burk, Ward and Morrison had all shown that carefully designed assessment materials could be used to identify specific areas of misunderstanding. Furthermore, they had shown and developed ‘correctives’ that could be deployed by the teacher that would close those gaps in knowledge or skill. This is precisely how an expert tutor works with a pupil. Bloom noticed that academically excellent students regularly follow up on their own mistakes that they have made on quizzes or assessments. They seek out their own correctives by asking the teacher to explain again and help them see where they have misunderstood. They often look up work again in textbooks, try questions over and over, search for other sources of information and repeat work so that they will not make the same mistakes in future. Key to learning a new idea is the underlying knowledge and skills to enable one to do so. In a mastery model, teachers use carefully designed questions, surveys, quizzes or activities to reveal the readiness or otherwise of each individual child in the class. These questions are incredibly difficult to design, as Burk and Morrison discovered – each taking many, many years to refine their materials. But, given that the body of knowledge for many subject areas is, in large, unchanging, once the questions have been created, schools can re-use them. Question design of this type – where the question or activity itself is carefully structured to reveal misconceptions or knowledge gaps – therefore becomes a key skill for the profession as a whole. Where gaps or misconceptions are identified, the teacher directly and purposefully teaches the individual or individuals the knowledge or skill where they are deficient. The intention is to ensure that all students, before the group teaching of a new idea commences, have the foundations for new learning. Leyton (1983), Deshler & Schumaker (1993) and Vockell (1993) all confirm the positive impact of even relatively brief pre-teaching for students whose prerequisite knowledge and skills are deficient. When first beginning to implement a mastery model for schooling, teachers often express concern that those students who demonstrate they are ready to proceed with new learning could be held back by the fact that the teacher must spend time directly teaching students whose skills are deficient. This concern stems from teachers existing in a current system, where concepts or ideas are limited in scope by national curricula or state-wide programmes of study. However, given that ideas are infinitely broad in their scope, it is appropriate for the student who is ready to proceed to spend time instead taking the prerequisite idea beyond the curriculum. In a mastery model, many students find that they spend a great deal of their time on what would, in a conveyer belt system, be thought of as extension or enrichment work. A student's readiness to proceed would be determined by their attainment on the prerequisite quizzes or tests. Carleton had argued that students should attain 100%, but Bloom more reasonably set the threshold at 80% to account for normal human fallibility, which does not necessarily indicate a lack of understanding, knowledge or skill. A mastery model for schooling emphasises the importance of engaging all students in high-quality, developmentally appropriate, research-based instruction. To ensure the highest chance of impact across a group of students, the instruction should be varied in approach, resource, task and metaphor. The subject specific knowledge and pedagogy of a teacher is central to the success of a mastery approach, since they now need to have multiple ways of communicating and teaching each and every concept or idea. Teachers adapt their instruction according to the knowledge, skills, dispositions, and background characteristics of students. The teacher models approaches to solving problems or addressing ideas. They also give students extensive materials for deliberate practice so that they are able to embed and consolidate what took place in the classroom. The key reason that the teacher asks questions or requires students to undertake activities or tasks in the classroom (in their presence) is so that they can notice and act. The type of assessment does, of course, vary with subject, but at its heart a formative assessment is any device that a teacher uses to gather information about an individual student’s level of understanding or lack thereof. The assessment process itself also serves to reinforce what the expectations are of the students, giving them the opportunity to identify what they have learned well and what they need to improve. The teacher carries out formative assessment continually, using carefully designed questions, prompts, quizzes and so on. As they notice something about a student they then are able to act and intervene immediately. It is this immediacy that drives the impact of the approach. Feedback is in the moment and contextualised. Rather than waiting a term or so and then administering an exam, teachers are noticing in real-time the needs of the individual students in the class and immediately intervening through the use of high quality correctives. Regular, low-stake quizzes also provide students opportunities to practise and consolidate knowledge and skills. It should be self-evident that moving on with teaching an idea that relies on one or more ideas that students do not yet understand will only result in failure, but as Bloom noticed (and as is still prevalent today in England), that is exactly what was happening. 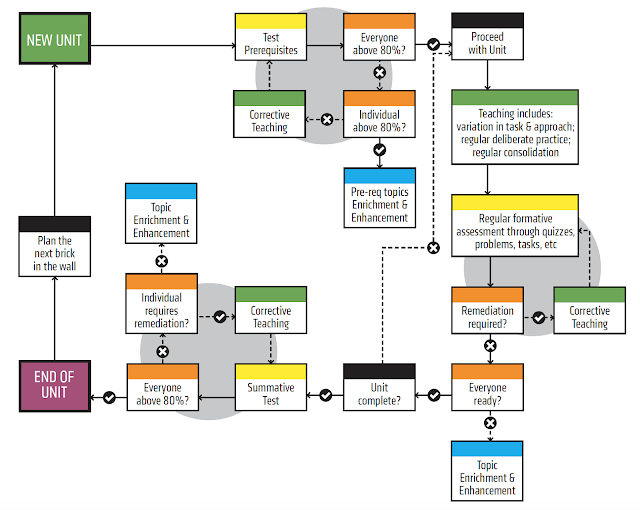 A mastery model for schooling uses formative assessment extensively to notice gaps. The teacher then provides high quality corrective instruction, designed carefully such that it will remedy the issue. Correctives are not the same as simply re-teaching an idea, where teachers often deploy precisely the same practice to teach a concept, skill or knowledge again but more slowly. Re-teaching is ineffective because the approach did not work with the student before – they were not able to ‘meaning make’ – and so, is highly unlikely to work as a repeat. Correctives are mindful of the way in which a student was taught a concept previously. The teacher considers their own practice, thinks about how they acted previously and then, with deep subject specific pedagogical knowledge, is able to deploy different practice to address the issue. In a mastery model for schooling, whether a student is successful in learning or fails to grip an idea is not seen as a result of some inherent capacity to learn. Here, the student learning or not is an outcome of the teaching. All students can learn all things, given the right time and appropriate conditions – those conditions include impactful teaching. So correctives are a key tool in the teacher toolbox. Clearly, there are great implications for teacher training, but I shall turn to those later. Block, Efthim & Burns (1989) showed that corrective activities typically add 10-20 percent more time to a learning unit than a teacher would predict (having previously been using a conveyer belt approach). This can be disconcerting for teachers when embedding a new a model for schooling, but Bloom argued that this intense, individualised assistance, offered early in an instructional sequence, would drastically reduce the time needed for remediation in later units. Again, this appears self-evident. When the teacher wishes to introduce new learning, the students will now be in a position that the prerequisite knowledge, ideas, concepts or skills are far more likely to be secure and able to be built upon. Thomas Guskey (2008) showed that initial instruction in later units can proceed more rapidly, allowing teachers to cover just as much material as they would do when using more traditional methods. It is common that small groups of students within a class will have the same identified needs, which means that corrective instruction can often be carried out in small groups. Recent studies exploring tutoring have confirmed that one-to-three tutoring can be as impactful as one-to-one. Again, the issue arises about what students who do not require corrective instruction will be doing while the teacher is engaged with those who do. This is where deep subject knowledge becomes important once more, so that there is an understanding within the teacher that any given idea, concept or skill they are teaching is infinite in its scope. One does not ‘master’ anything in life, but one can become increasingly more expert. Although the 10,000-hour rule does not really stand up to rigour, the idea behind it, that an individual must spend a very large amount of time on any given skill before becoming an expert, is a useful analogy here. Taking my own subject area, mathematics, it would be easy for a teacher in a conveyer belt system to convince themselves that a student can do some mathematical skill. For example, that a child understands counting. But counting is, for practical purposes here, pretty much an infinitely broad topic (I, for example, teach undergraduates the pigeonhole principle). Without needing to move on from the idea at hand, the teacher is able to extend students well beyond the demands of the year group or school curriculum, so there is always something for the students to be engaged with. As mentioned earlier, in a mastery model, most students will find themselves engaged in extension material at some point. Unlike conveyer belt systems, where students get only one chance to show how well they have learned, in a mastery model, assessments are ongoing and everyone involved – teacher, student, parent – is aware that they help the student to learn well. Following corrective instruction, the teacher will carry out a further assessment of the student in order to work out if the new approach to teaching has had the desired impact. This gives the student a new opportunity to show they have learned well and the teacher a new opportunity to celebrate their success. If the student still has not gripped the idea, then the cycle repeats. Imagine the analogy of learning to drive – an excellent example of a mastery model – where the learner fails the driving test. They are not then consigned to the scrap heap; they try again, they learn again, they listen to different approaches and they take the test again (and again and again) until they have passed. Once they do pass, they are as valid as every other driver on the road. Teachers treat learning the same in a mastery model for schooling – all will pass eventually and when they do, we celebrate it. There is no penalty for taking more than one attempt to pass – they deserve the same standing as the student who flew through the tests first time. The driving test is also a useful analogy in highlighting the fact that the intention is not that a student masters a skill, but that they achieve a level of understanding or competence that they can reliably build new learning upon. We all know that passing the driving test does not indicate one has mastered driving! It is merely a step in becoming more expert in driving – a journey that continues throughout one’s life. The cyclical nature of the unit delivery in a mastery model means that the teacher is engaged in different activities with different students – they may be teaching, assessing, correcting or stretching. This means that teachers provide activities, tasks or questions that allow students to take the idea into much greater depth and well beyond the expectations of the statutory school curriculum. These students gain additional insight into the subject and are able to build new schema for exploring the idea. Learning is not a linear process and all students benefit from extensive deliberate practice and consolidation, which can also be part of the enrichment process. This type of approach allows the teacher to remain within the same instructional sequence, but at the same time extend the learning to much higher levels. The enrichment and extension activities take a great amount of time to devise and develop – it is a complex process to ensure that an enrichment activity is truly valuable. Again, this becomes the collective responsibility of the profession and these activities should form part of the professional body of knowledge for each subject area. It is crucial that weak activities are rejected – having students, who are ready to learn more, simply biding their time is both damaging and morally objectionable. In 2015, I produced this diagram that summarises the steps detailed above, which Oliver Caviglioli kindly made into a poster, which you can download here. The cyclical nature of a mastery model for schooling is evident in the diagram. Applying mastery to my own subject, Mathematics. I am happy to address any other areas regarding mastery that you may find useful, please let me know. Interesting, reaffirming, challenging and informative, great stuff!! I enjoyed that, thank you. I'll be curious to see if you identify or show examples of assessments and extension work of the kind discussed here, particularly for maths. I am not, indeed never have been, fully convinced about pre-tests to ascertain 'exactly where learners are', nor indeed with post-tests to ascertain where they have reached. The implied spatial metaphor belies my experience that different people are in different 'places' at the same time, and the same person is in different 'places' at different times. Of course it is important to have a sense of what might be available, accessible, approachable by learners, but, as I think you can interpret Margaret Brown & Brenda Denver as demonstrating, what people learn is not necessarily what is being taught! Put another way, following Gattegno, learning takes place during sleep, not during lessons: it is about what can be forgotten or down-played, so that other experiences are to the fore. Or yet another way, the more of the human psyche involved in an experience, the more memorable, or more properly, the more re-memorable, accessible it is likely to be. So, enaction, emotion and cognition, as well as will and attention are all important. As for individual vs group tuition, neither is for me preferable over the other. benefits can be found for both. Maximum effectiveness occurs in the crafted interweaving of both, which is what the Six Modes (expounding, explaining, exercising, examining, exploring, expressing) try to help keep in mind. Incredible. Thank you for taking the time to research, write, and publish this. Will be digging in over the coming weeks as time allows. Much of value - not only in teaching maths, but also music, and ultimately, all aspects of teaching and learning throughout school and beyond.